It’s no secret that The Guardian doesn’t have any great love for Israel. Just this week, the newspaper of choice for many British liberals has published three articles about the Jewish state. All three are deeply critical. Not that criticism of Israel is inherently wrong. Millions of Israelis are critical of their politicians and government on a daily basis. A problem emerges, however, when one’s criticism becomes so one-sided and shallow as to effectively parrot Hamas propaganda. The Guardian’s editorial today is a case in point. Literally, the day after only his helmet prevented an Israeli soldier’s certain death when a Hamas terrorist shot at him, The Guardian publishes a lead editorial which deliberately blurs the lines between peaceful protesters and violent rioters, failing to acknowledge that Israeli soldiers were tasked with preventing angry hordes from breaking through the security fence and descending on Israeli villages. Instead, the article opens with talk of “Palestinians” being “killed at the rate of around one a day”. The mind boggles at how sensible, educated people regard the fact that Israel defends itself from Palestinian violence using lethal force as somehow an indictment on Israel. Instead of questioning why Palestinians repeatedly eschew peaceful protests to take up arms and attack Israelis, The Guardian focuses on why Israel defends itself. Instead of querying Palestinian motives, the editorial unquestioningly repeats the Palestinian mantra that these protests were about the “right” to return to ancestral homes. This is false on multiple fronts – first, because while that was indeed the original concept, the protests were swiftly co-opted by Hamas and used as a pretext to invade Israeli borders. 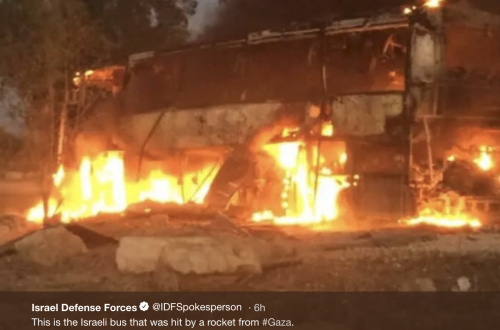 Numerous videos exist of rioters and terrorists entering Israeli territory with machetes, burning Israeli army posts and fields to the ground, and destroying humanitarian crossings. Second, there is no such right – the UN offered the Arabs and the Jews two states in this land. Instead of accepting as the Jews did, the Arabs called on the combined armies of Jordan, Egypt, Syria, Lebanon and Iraq to attack Israel with the aim of destroying the nascent state. Yet Israel survived, and its borders were internationally recognized. There is no going back to what used to be. The Arab gambit failed. “Israel has never shelled protesters at the Gaza border fence and to claim otherwise is an outright falsehood”. Not content to repeat Hamas talking points, the piece makes some stunningly inaccurate and outright deceitful claims. One sentence in particular claims that Israeli soldiers “gas, shell and kill protesters”. Such a simple phrase, yet riddled with deception. First, “gas.” Such a hideously vague word. Israel uses non-lethal tear gas as a means to disperse riots. In a region where chemical weapons have been repeatedly used (by Assad in Syria, most notably), it would be decent to distinguish between weapons of mass murder and riot control measures. Sadly, The Guardian has no compunction in blurring the lines. Second, “shell.” The Israeli army categorically does not shell protesters. Israel has never shelled protesters at the Gaza border fence and to claim otherwise is an outright falsehood. The IDF does occasionally fire tank shells at Hamas positions – legitimate military targets under international law – though. Either The Guardian is utterly ignorant to the difference between peaceful protesters and armed terrorists, or it willfully muddies the waters. Finally, the editorial says soldiers “kill protesters.” The only people identified in the editorial as being killed by Israel are protesters. There is no space in The Guardian’s narrative for armed terrorists. If the editorial wanted to offer its readers a truly balanced, critical take, it could at least mention the fact that hundreds of armed rioters attack Israel’s border at each protest. How is there not a single mention of the fact that Hamas uses children and youths as child warriors and human shields? What of all the petrol bombs, rockets, guns and knives? It’s hard enough for readers abroad to understand the complexity of Israel’s geopolitical reality without leading media outlets casting Israel’s legitimate acts of self-defense as gratuitous belligerence. It’s laughable, and lamentable, for a paper claiming to offer “independent journalism the world needs,” to deliberately obscure the fact that Israel faces terrorists who manipulate international human rights law to their benefit by hiding behind human shields and teen soldiers. Israel defies simple headlines, and is more complicated than Guardian editorials would ever admit. With the media so unreliable, it’s important than ever to come and see Israel for yourself, without biased intermediaries. Join HonestReporting’s upcoming Mission this Spring to see how Israel contends with a range of social and security challenges and has become a thriving hub of democracy. This is a cross post by Emanuel Miller, Marketing and Content manager for HonestReporting, an organization dedicated to defending Israel against prejudice in the media.